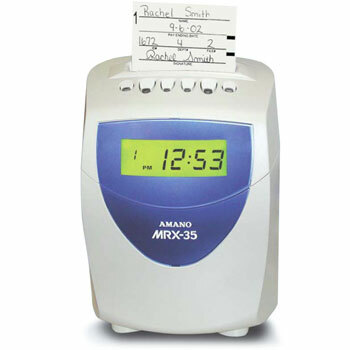 The MRX-35 Electronic Calculating Time Clock is your next logical step from a non-calculating clock. Fully automatic, reliable and economical, yet powerful enough to meet your needs today. Simple, clean design fits any office decor. 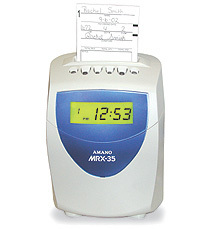 Automatically calculates hours, eliminating errors and improving accuracy. Replaces time sheets and clock with computerized time calculating terminal. Automatic calculation of daily and weekly overtime. Accumulated totals for regular hours and two overtime levels. Large, easy to read digital liquid crystal display. Easily programmed through the use of programming cards. Programmable revision and exception zones. Accommodates weekly or bi-weekly payroll. Automatic Daylight Saving time adjustment. Uses pre-printed bar coded time cards. Dimensions: 6.70"W x 9.2"H x 4.5"D.
Power supply: 110/120 VAC ± 10%, 50/60Hz. Power consumption: 4W (idle), 13W or less (printing). Ambient temperature: 14°F - 113°F. Humidity: 10% - 90% (no condensation). Clock system: Liquid Crystal Display (date, hours, minutes). Memory: Clock and programming data stored for up to 3 years without AC power.